River Phoenix wears flint khaki (light tan) high top Converse “Chuck Taylor” All Stars in the film. 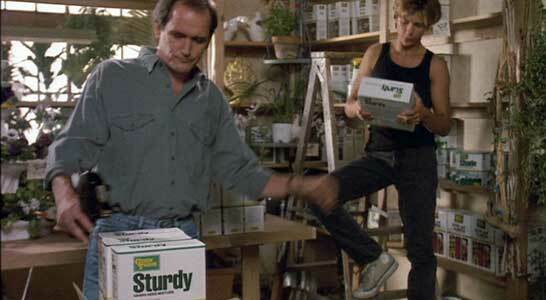 Jeff Grant helps his father put away stock in their nursery. Little Nikita is about the Grants, a seemingly All-American family living in Fountain Grove, a suburb of San Diego. Richard and Elizabeth Grant (Richard Jenkins and Caroline Kava) run an independent family nursery business, while their son Jeff, (River Phoenix) is a popular high school athlete who wants to attend the Air Force Academy and become a pilot. As part of the admission process, all candidates to the academy are screened by the FBI, and when agent Roy Parmenter (Sidney Poitier) runs a routine check on the family background, he discovers that the birth certificates for both Richard and Elizabeth indicate that they died in the 19th century. When Jeff comes in for an interview about his application with Parmenter, Roy tries to probe him for information, but discovers that Jeff is a normal, although somewhat nervous, teenager. The Grants welcome their new “neighbor”, FBI agent Roy Parmenter. Meanwhile, events in the Cold War take an active hand in shaping the story. A renegade KGB agent code-named Scuba (Richard Lynch) has been systematically tracking down and killing undercover Russian agents in an effort to extort a large amount of cash from his ex-bosses. The FBI is also aware of this and it has a personal meaning for Roy, because Scuba killed Roy’s partner during an operation twenty years ago. The KGB sends in their top agent Konstantin Karpov (Richard Bradford) to track down Scuba before he can do anymore damage. Karpov decides to enlist the assistance of Jeff’s parents who we discover are also KGB moles placed undercover years before, and could also be on Scuba’s list. In the movies, of course, the FBI has complete surveillance control over the border, and Karpov is spotted coming in. (Maybe because he comes across the border using public transportation, a bad accent, and wearing a heavy dark suit and fedora?) When it is reported that Karpov has gone to Fountain Grove, Parmenter remembers the unusual circumstances regarding the Grants, and decides to go there to pursue the case. 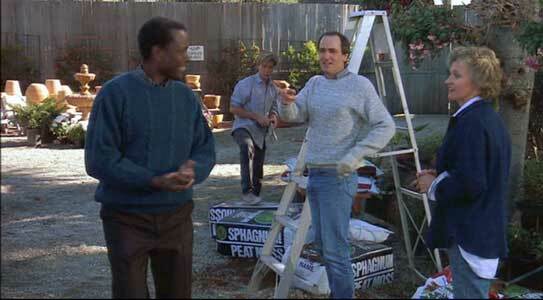 He arranges to move into the neighborhood where the Grants live, and tries to enlist Jeff to help him. But Jeff is disbelieving and panicked when Roy reveals the truth to him about his parents, and first tries to run away. Eventually he discovers the truth when he finds his parents’ hidden passports. The Grants having grown accustomed to their comfortable American lifestyle are reluctant to assist Karpov. To force their compliance, Karpov takes Jeff hostage when he gets the opportunity. The balance of the film is about the efforts by Roy to catch Karpov and Scuba, and free Jeff. Karpov takes Jeff through downtown San Diego. 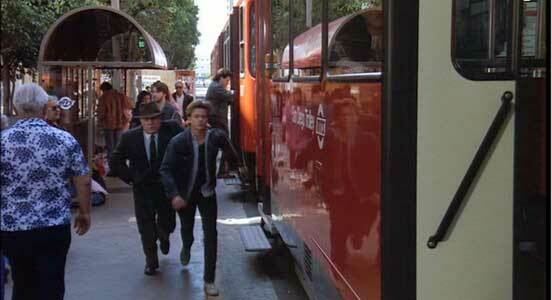 One might question why a film like Little Nikita would even be released in 1988, given the end of the Cold War. Maybe the producers figured that they had better hurry and get this out before everyone forgot what the Cold War was about. But as a spy thriller, the story line leaves a lot to be desired, especially in the way that the principal agents seems to act alone, without backup, and so brazenly in public places, given the seriousness of the situation, and the murderous bent of the bad guy. Maybe the deténte angle is in the way that both the Poitier and Bradford characters behave as though they belong to an international spy fraternity. Little Nikita seems to be an attempt to bring a modern edge to classic “family style” spy thrillers like Hitchcock’s The Man Who Knew Too Much. You can see an attempt to imitate the style in the ballet sequence, when Karpov first meets face to face with the Grants, telling them what they must do and confronting their relectance. While a Tchaikovky ballet is being performed, you see intercuts of the dancers, the Grants and Karpov arguing, and Jeff at their home, discovering proof of his parent’s true identity. But too much information is presented early in the story line, and as a result the all-knowing audience doesn’t focus in enough on any of the main character’s point of view for a lot of true suspense to build. River Phoenix gives a good performance as the ebulient Jeff, although his main respone to the sudden turmoil in his life is additional “attitude” in his reactions, which is continually brushed off by the other characters. Sidney Poitier was probably coached to play his part like an American James Bond, but not enough time was given to him to develop either of his dual personalities of hard-edged agent pursuing the man who murdered his partner or romantic good guy pursuing the guidance counselor at Jeff’s school. While any success of Little Nikita lies with the acting performances, much of the failure of the film to be a cinematic success as a spy thriller is due to the unbelievable writing in many situations, probably because the script was worked over several times by different writers. As a result there are too many clichés and perfunctory developments, like chess pieces moved around on a board, instead of people moved by good dialogue and a range of human emotions besides bravado. The direction by Richard Benjamin doesn’t show much understanding of the spy action/ genre and as a result, this film has the pace of an episode on a television series rather than a go-for-broke large screen thriller. But if you like the work of Sidney Poitier or River Phoenix, Little Nikita is definitely worth a look. Jeff is in danger of being thrown onto Interstate 5. Jeff and Agent Roy Parmenter play some basketball. 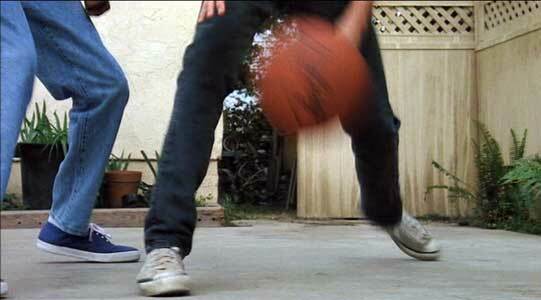 Rvier Phoenix in his role as Jeff wears flint khaki (light tan) high top chucks throughout the film — one of his favorite colors besides black. 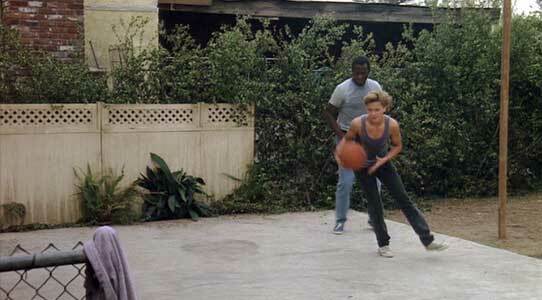 The best chucks scene is the one-on-one basketball game that he has with Sidney Portier, a good visual image of the sparring between them that goes on in the movie. Jeff tries out some fancy footwork. Little Nikita. (1988) Sidney Poitier, River Phoenix, Richard Bradford, Richard Lynch, Caroline Kava, Richard Jenkins. Directed by Richard Benjamin. Categories: Drama, Action/Adventure, Crime and Mystery.